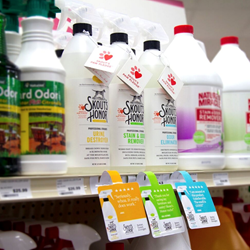 Skout’s Honor, the line of Better, Faster and Stronger solutions to everyday pet stain and odor problems, today announced the addition of three new U.S. distribution partners: Bark to Basics, Natural Animal Nutrition, Inc. (NAN) and Fauna Foods Corp. The new partners join Skout’s current line up of distributors, which include: Central Garden and Pet, Veterinary Service, Inc. (VSI), United Pacific Pet (UPP), and Aloha Natural Pet Supply. Bark to Basics is an award-winning company founded in 2002 and is dedicated to improving the health and longevity of dogs and cats by providing high-quality products to independent retailers across the Midwest region. NAN was founded in 1981 as a manufacturer and distributor of therapeutic nutritional products and services independent pet retailers, kennels, veterinary hospitals and health food stores throughout the Mid-Atlantic. Lastly, Fauna Foods serves the independent pet channel in the Northeast, and has a proven track record of providing outstanding service for over more than 38 years. The Skout’s Honor product line currently includes 35 oz. spray bottles of: Stain & Odor Remover, Odor Eliminator, Urine Destroyer, Litter Box Deodorizer, Patio Cleaner & Deodorizer, Cat Urine & Odor Destroyer ($14.99 each), as well as gallon-sized versions of its Stain & Odor Remover and Urine Destroyer ($44.99 each). Skout’s Honor is Better, Faster and Stronger than other leading products in their category, due to a proprietary odor eliminating technology and BioKore™ - a revolutionary green cleaning technology – that breaks down and lifts away stains on contact. Both formulas are biodegradable, bio-renewable and non-toxic – offering the most powerful cleaning solutions on the market, while still being safe for use around pets, family and home. For specific retail locations, please visit the store locator.